It was a major weekend in the World Cup, with a triple GS win by Alexis Pinturault, who nailed his first consecutive win in Japan last weekend and locked it in with two more this weekend in Hinterstoder, Austria. During Friday’s race, Pinturault smacked a gate and suffered serious bruising on his thigh, but was still able to complete the course—a challenging, bulletproof one at that—and come through with a victory Sunday as well. 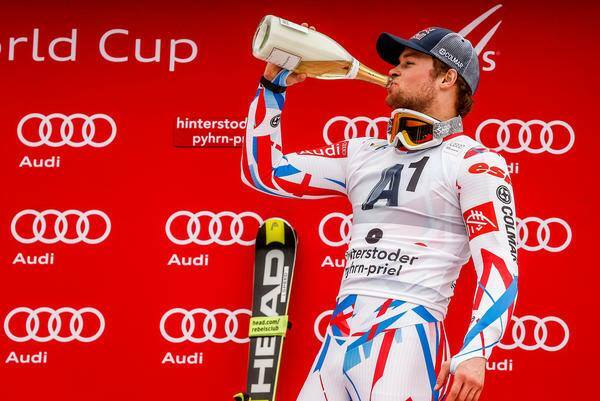 Though the season started out slow for the French racer, he’s gained momentum since Kitzbühel, with 5 season wins. Marcel Hirscher also had a strong weekend, landing on the podium in each race—he took second to Pinturault in Friday’s GS, third in Saturday’s Super G, and 2nd (to Pinturault yet again) in Sunday’s GS. As he works his way closer to an overall title (he currently leads by nearly 300 points), Hirscher might be on the road to making World Cup history. An overall win in 2016 would mean Hirscher’s fifth consecutive title, and a World Cup first. Meanwhile, the women raced Super G and Combined in Andorra. Italy’s Federica Brginone took first in Saturday’s Super G, after Vonn—who was leading by .32—took a major fall. Low visibility and heavy snowfall had delayed the race by three hours, and Vonn hit a patch of soft snow low in the course that left her with a fractured a bone in her knee. However, the indomitable racer was back on Sunday, racing conservatively but furthering her overall lead ahead of Lara Gut. Check out video of her fall and her rapid return to the race course below. The United States’ own Laurenne Ross took second in Super G, followed by Australia’s Tamara Tippler. In Sunday’s Alpine Combined, Canada’s Marie-Michele Gagnon took first, followed by Wendy Holdener and Anne-Sophie Barthet. Check out the full results below.